Designed for medium-sized businesses, the Brother DCP-8110DN is a multifunction laser printer. This unit can copy and scan and deliver prints with a maximum resolution of 1,200 x 1,200 dpi. It has built-in Ethernet for easy networking and it can deliver 50,000 pages per month. The Brother DCP-8110DN is integrated with 64 MB memory and it can be expanded to 320 MB. This unit has a stand-alone copier, no need to turn on a PC. A fax machine is not available. The compact Brother DCP-8110DN mono laser printer comes in all-black. It has a flatbed scanner with an automatic document feeder and offers Ethernet and USB connectivity. The DCP-8110DN has a good print speed of 38 ppm and it can handle 250 sheets at a time. The control panel comes with navigation and function buttons plus a backlit LCD display. The high speed Brother DCP-8110DN office mono multifunction printer weighs 34.4 lbs and measures 15.9 x 16.3 x 16.7 inches. The high capacity black Brother DCP-8110DN toner lasts for up to 8,000 pages. Users can expect high-quality prints, copies, and scans from the Brother DCP-8110DN printer. This unit has excellent features including an automatic document feeder, a duplexer for double-sided printing, and a USB host to allow direct printing from and scanning to thumb drives. The Brother DCP8110DN all-in-one laser printer has a standalone copier and users can easily share the unit, thanks to the Ethernet. This compact unit also has mobile device compatibility including Google Cloud Print and AirPrint. Unlike other multifunction units, the Brother DCP 8110DN does not come with facsimile function. 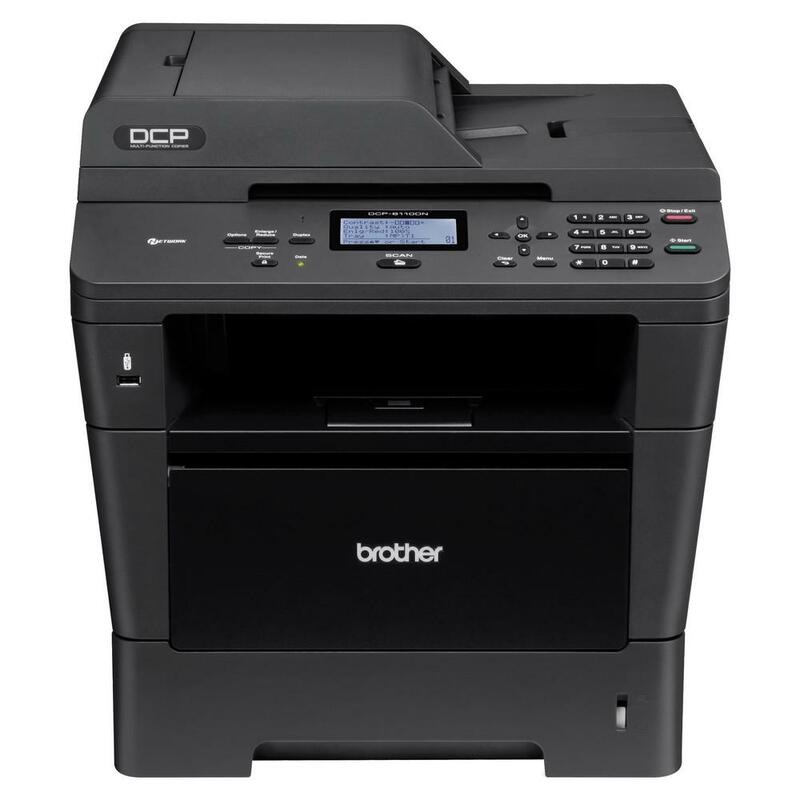 The Brother DCP-8110DN MFP could be better if it had Wi-Fi connectivity.